The cockpit (outside view) was painted by Snorri! Adolf Borchers (10 February 1913 – 9 February 1996) was a German former Luftwaffe fighter ace and recipient of the Knight's Cross of the Iron Cross during World War II. A flying ace or fighter ace is a military aviator credited with shooting down five or more enemy aircraft during aerial combat. His brother, Major Walter Borchers received the Knight's Cross on 29 October 1944 as Gruppenkommandeur of III./Nachtjagdgeschwader 5 (NJG 5). 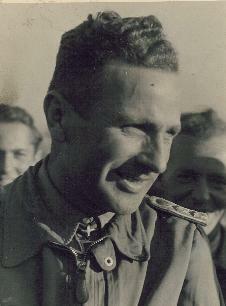 A second brother, SS-Hauptsturmführer Hermann Borchers received the Knight's Cross on 16 October 1944 as commander of the I. Battalion of the SS-Panzergrenadier-Regiment 19. He was born in Wendhausen near Lüneburg. He joined the Condor Legion in the fall of 1938 and participated as a Unteroffizier in the Spanish Civil War. After the Spanish Civil War he was transferred to 2./Jagdgeschwader 77 (JG 77) which later became 11./Jagdgeschwader 51 (JG 51). In this unit he fought in the Invasion of Poland, Battle of France and Battle of Britain, claiming 5 kills in the west. During Operation Barbarossa he accumulated further victories and by the end of 1941 his score had increased to 23 aerial victories. After being promoted to an Officers rank he was made Staffelkapitän of 11./JG 51 on 8 October 1942. By the end of 1942 his score stood at 38 aerial victories. In 1943 Borchers married the famed skier Christl Cranz. For 78 aerial victories he was awarded the Knight's Cross of the Iron Cross. On 11 June 1944 he was put in charge of I./JG 52. He claimed his 100 aerial victory on 24 July 1944. His 118th victory claimed on 2 September 1944 is also noted for claiming Jagdgeschwader 52 (JG 52) 10,000th kill. Gruppenkommandeur Borchers was transferred to III./JG 52 on 1 February 1945. Together with his fellow comrades he surrendered to US force only to be turned over to Soviet forces. Borchers was officially credited with shooting down 132 enemy aircraft in more than 800 combat missions, the majority were claimed on the Eastern front and five were claimed in the Battle of France and Battle of Britain together. After World War II he and his wife, Christl Cranz, found a Ski school which she led until 1987. Knight's Cross of the Iron Cross on 22 November 1943 as Hauptmann and Staffelkapitän of the 11./JG 51 "Mölders"
a b Fellgiebel 2000, p. 140. Fellgiebel, Walther-Peer (2000). Die Träger des Ritterkreuzes des Eisernen Kreuzes 1939-1945. Podzun-Pallas. ISBN 3-7909-0284-5. Spick, Mike (1996). Luftwaffe Fighter Aces. Ivy Books. ISBN 0-8041-1696-2. Weal, John (2004). Aviation Elite Units Jagdgeschwader 52 The Experten. Osprey Publishing Limited. ISBN 1-84176-786-7.